“Energetic. Enthusiastic. Compassionate. Caring. These are four words that can be used to describe the aura that radiates from Jane Meagher the moment she walks into a room. Eight years ago (2004) Jane accepted the daunting task of helping to convert the infamous New Occidental Hotel from one of Winnipeg’s roughest and toughest bars into the Red Road Lodge – Home for Recovery. This was established as a dry facility, focused on helping people transition from substance abuse and homelessness to safe, stable housing, supplemented with life and job skills programming. Jane Meagher brings a fresh approach and new ideas to every situation based on her lived experience and her vast understanding of substance abuse, mental health and homelessness. She understands the importance of respecting cultural diversity, as well as an individual’s right to alternative lifestyle choices. During Jane’s seven year tenure at the Red Road Lodge she worked one-on-one and in group settings helping people recognize their strengths and weakness. She motivated them to regain their self respect by having them take control of their own lives. “Jane Meagher is the consumate coach, but unlike many others she is a very global and strategic thinker who is equally gifted at not only helping her clients develop effective career and team solutions but also at helping them make those solutions a reality. “A few years ago, as Agency Producer of Clark Communications (now Clark/HuotCocoon), I hired Jane Meagher to assist one of our clients, Cambrian Credit Union. Cambrian Credit Union was introducing a significant change in its service fee structure which following introduction to its membership, needed a complete buy-in by front line staff. Cambrian felt that to successfully make this shift, it was essential that staff were supported. Working with Cambrian executives, Jane developed a program focused upon positive response to change. The program began with a keynote address presented by Jane to all levels of corporate management, branch managers and the entire staff of the nine branches of the Cambrian Credit Union system. Jane’s presentation was spectacular! Within seconds, she had the people sitting on the edges of their seats. Her energy gripped the room. She talked about change and how we as human beings are resistant to it. Having compassionately acknowledged the difficulty we have in accepting change, through the use of humour and personal examples – Jane’s talk focused on embracing that change. By the conclusion of her keynote address, the transformation of the tone in the room was palpable. The resistance and tension had been replaced – with laughter and team spirit. This transformation occurred nine more times, as Jane subsequently led workshops at each of the Cambrian branches. “I would like whoever is reading this to know how profoundly Jane Meagher has impacted my life. Through our coaching sessions she made me understand that purging my thoughts and not repressing them was a healthy way to alleviate the stress and frustration I was constantly experiencing. Better yet, by teaching me what kind of person I am through Typology, she made me realize why I would think the way I did, and she gave me the tools to work on the negative aspects of my life. Words cannot express the gratitude I have for the tools Jane Meagher gave me, and the courage to use them. Tyler’s hopes certainly did come true. 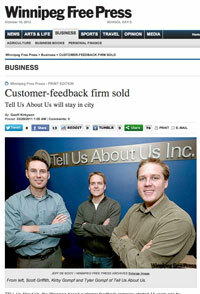 Read a Winnipeg Free Press article from March 29, 2011.